It seems like this week is a week for practicing my topstitching! 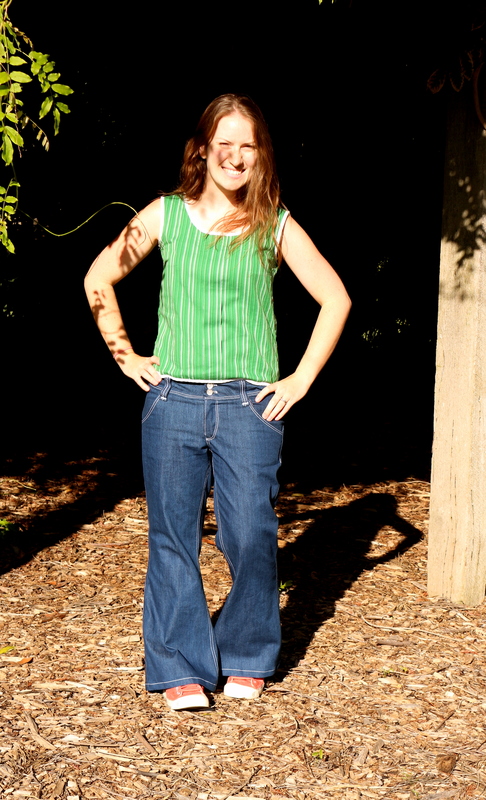 I had previously signed up for a class on Craftsy – Jean-ius: how to reverse engineer your favorite fit…. but then everything got busy with the move, and I swapped an active lifestyle for one where I mainly sat around watching NetFlix all day… unsurprisingly, those favourite jeans that I wanted to reverse engineer to make another pair? Yeah, they no longer fit. Wahhhhh! No, your eyes are not deceiving you. This is number two of my new to me challenge items, and the one I had originally planned to make before I got distracted by the Kimono Jacket Pattern. 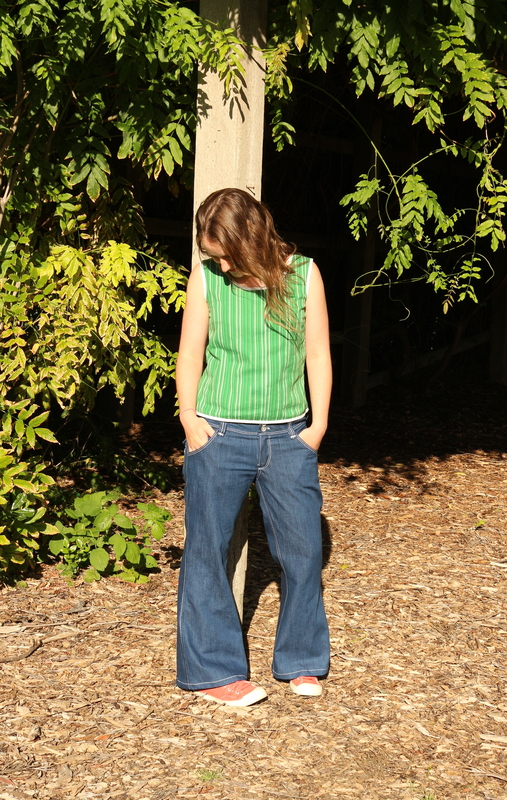 When I was looking through the list of indie designers in preparation for a little bit of indie sewing this month, I came across Angela Wolf, and was drawn to these jeans. Their shape was reminiscient of a pair of jeans loved long ago while I was at college, a beautiful pair from Moto that had lightning bolts embroidered on the back pocket. Sadly, the last time those fit were post glandular fever in my twenties, I no longer have those skinny teenage hips. So…. JEANS! We can do this people! 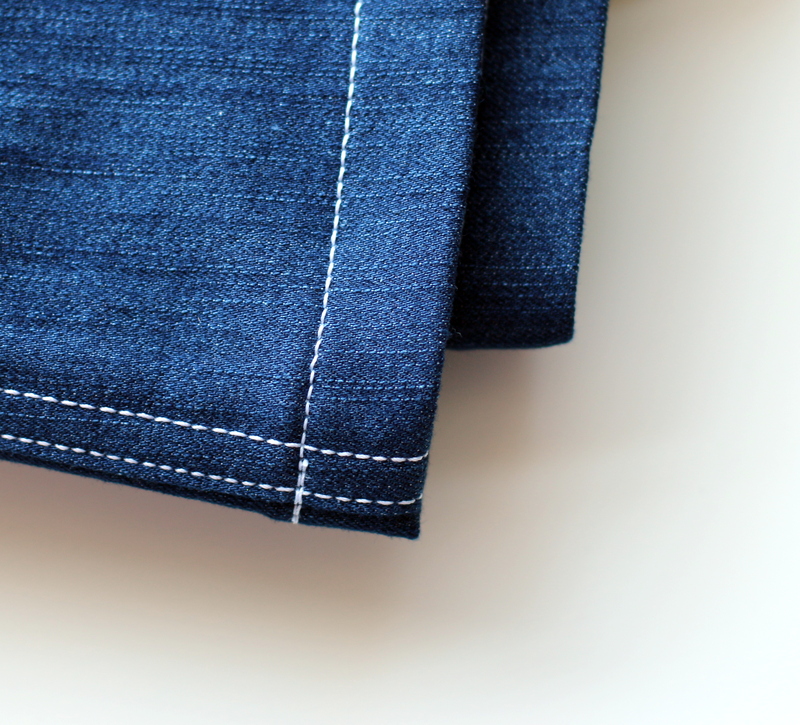 This pattern calls for denim with 2% elastane/spandex, and goes together with the aid of a sewing machine and serger (although you could probably sub the serged edges for zigzag). The instructions were a little hard to get my head around to begin with, especially when it came to assembling the fly, but I made a practice pair to test the fit, and this helped A LOT. I cut a size 12, and used heavy duty thread for the majority of the seaming, with white and yellow topstitching thread for the details. The waistband and belt loops I stitched as directed in the instructions, and I lined the pockets with some bright bright fabric (leftover from a little something I might submit next week for the frankenindie challenge)! Until you sew together the side seam (pre sewing on the waistband), you can’t really judge the fit, but it is quite easy to make adjustments simply by tapering in the side seam at the knees/waist etc. Check out those beautiful pockets! I think they look pretty good, I like the look of the white topstitching on dark denim, kinda gives them a fancy “Yeah I paid $200 for these” look. The fit on me is a kinda relaxed type fit, which is what I like. My verdict on the pattern? At first I found it very confusing. But I made a test pair to check the fit of the waist/hips, and that helped me make sense of it. For the most part I found it confusing because it was the first time I had ever made jeans, and assembling the fly is a whole new world! Otherwise the instructions are actually really helpful once you get your head around it, and they went together pretty easily, although it was quite time-consuming with all the steps required, and switching between thread and stitch length for topstitching. Another 4 buttons? – No, just the original 4 buttons repeated. Also the 1 yard of twill tape? What width? 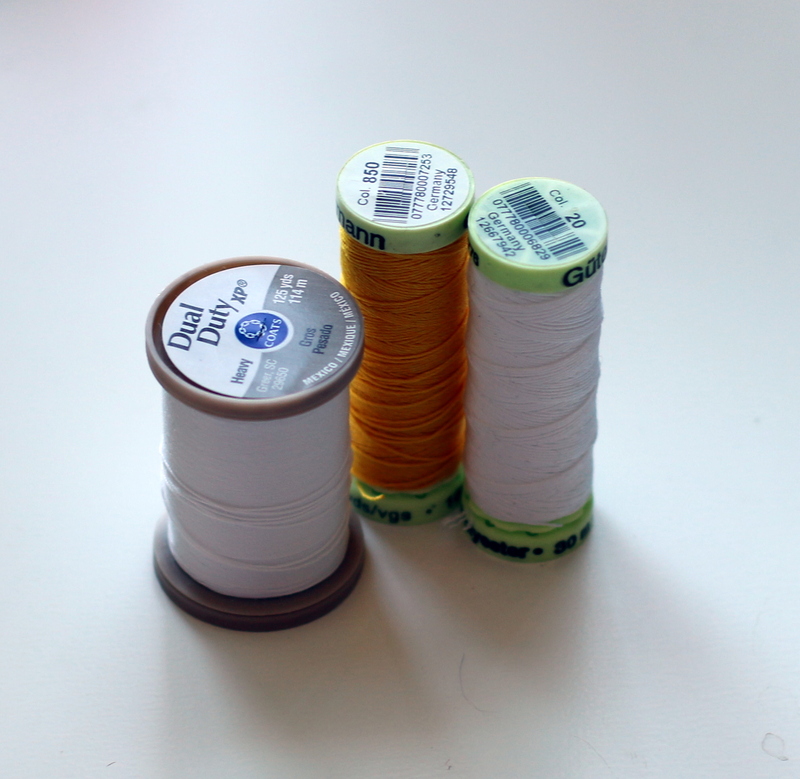 Luckily I had bought 2 spools of topstitching thread, as I would have run out otherwise, so it would have been helpful to have an approximation of how much thread was going to be required for topstitching. Running out mid-project would have been really annoying! Also, the pattern has 45 pages to it! 45! One BIG pattern! 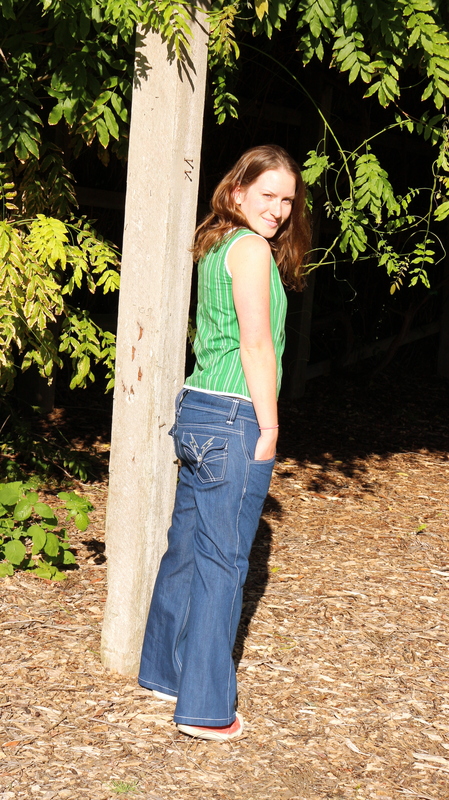 Otherwise, I am LOVING these jeans! As previously mentioned, I have cut these in a very relaxed fit, even though the stretch denim could have probably handled a tighter fit, but I that is generally how I like them, and I like how they fit on me. But I would use this pattern again, and perhaps fit them more around the knees, then tapering out again to a nice big flare. Me too! Really happy with how they came out! These look absolutely wonderful, and I love your top stitching on the pockets! Thanks! I am really pleased with them. Will definitely make them again! Wow, your top-stitching is spectacular! Great job.